...a lovely way to start the day! We are so fortunate to have won tickets to the Metropolitan Opera at Lincoln Center and tomorrow we will see Rossini's Armida. Rob, a musician and singer is very excited to be able to see and hear Renee Fleming who has the starring role. I hope your Friday brings something fresh and new! I love your blog. I just bought a bunch of beads today, too, and sorted them into little jars. I don't even mind the sorting. I love the jar of buttons, oh yes hours of fun!! Enjoy the Opera, I've been a few times and it is a great experience! Grandma used to let me dump her button jar out and play with the buttons ...thanks for the reminder of a sweet memory! My daughter loves relaxing going through old button jars- she calls it "Button Therapy"! Your photographs are truly stunning, I could sit and look at them and take myself away! Love buttons and you sure have a collection! How wonderful to get to go to the Opera! Enjoy! 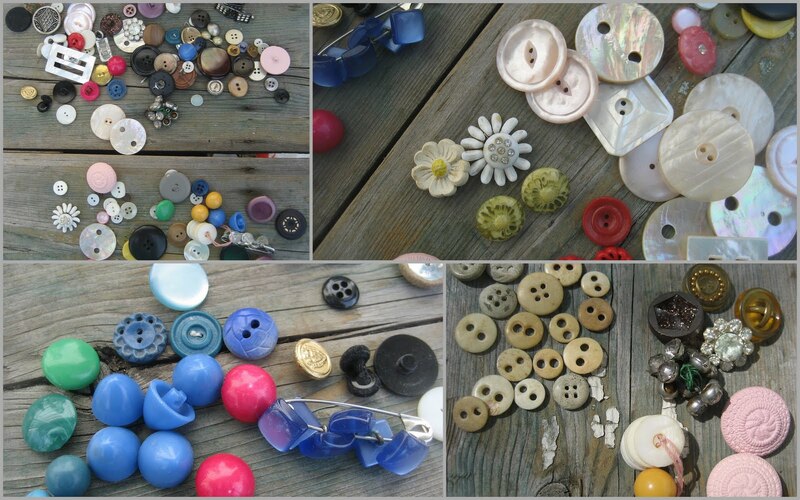 It seems everyone has a love of buttons, including me! I sorted through my huge stash of buttons last week and separated them by color so that I had a better idea of what I had. They look very pretty right now compartmentalized in a printer's drawer....just don't know how long they'll stay this way. Oh Laura j'ai aussi acheté un gros lot de boutons mais en nacre blanche que j'ai mis dans un grand bocal. Bonne soirée à l'opéra où j'ai eu la chance d' aller,un rêve! I also really enjoy spring and its flowers and greens. Never so green as in spring! Have a nice time at the opera! And by the look of it, you found some real gems. Enjoy tomorrow evening!! and have a good weekend too........hugs from me !! bye ! When I was a child my mom gave us buttons when we played 'shop'...the buttons were the money....I did the same with my child...And now everytime I open up the sewing box...I see her and my childhood....lovely! What a wonderful jar of buttons, Laura! That was certainly a great find at the flea market. Have a wonderful time at the opera - how exciting! Your button collection is a wonderful find. So many of the ivory ones...how fortunate. I adore the older ones. Have fun with them and at the opera. I have never been, so, please, share your first-hand experience. Can't wait. Have a fun weekend and bless you. Fresh and springy pictures! Love buttons and you sure hit the jackpot with those:) Have a blessed day and all is beautiful where I am! HUGS! Love the buttons, great score!! And the little white bunny is so cute!! We have had beautiful weather today and everything is bursting into bud. One of my favourite times. I am loving your buttons in the jar. They do remind me of my childhood, so much. have fun at the opera. Enjoy the buttons AND the opera! Renee Fleming is from our hometown of Rochester, NY. She is fabulous, I know you will have a great time...soooo jealous! Laura, I just found some mother-of-pearl buttons (currently soaking in dish detergent) at the antique store today for $3! Good deal! What is the "contraption" leaning against your tree? Is it an anti-squirrel gadget? I'm very curious about it! I'm so glad to see you visiting and posting today. Thank you for saying hello! Oh yes, lovely buttons. I have a MOP buckle (or two) just like the one I can see in your picture. You are going to have a LOT of fun sorting those! I've been collecting tiny jewellery bags to help my mum sort her collection. How would you sort them? Thanks for stopping by my place, so glad to be back! I love the pictures, I can smell the fresh cut grass from here!